Are you on a low-carb diet and interested in health? Do you like the sun, warm weather, adventures and a chance to find new friends for life? Here’s your chance. Finally, all the pieces are in place for this year’s big low-carb cruise. In the week of May 24th–31st, the eighth annual Low-Carb Cruise to the Caribbean will take place. Unfortunately, last year I had to stay home, but this time we’re making up for it. Eleven members from Team Diet Doctor will be joining. Yes, you may have a good time while trying to save the world. We’ll be recording lots of videos, gathering knowledge and networking with our American friends more than ever. Feel free to join us. This will be my fifth time, and it’s one of the highlights of the year. The cruise will sail from Ft Lauderdale, Florida, and last a week. 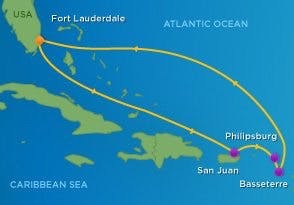 We’ll make port in San Juan, Puerto Rico, Philipsburg, St. Maarten & Basseterre, St. Kitts according to the cruise route outlined on the map to the right. Lectures are confined to the days when we’ll be at sea. On days in port there will be plenty of time for adventures, swimming and sun – the latter is of course also found onboard all day, if you don’t want to sit and become wiser the entire time. The ship has everything you can want. 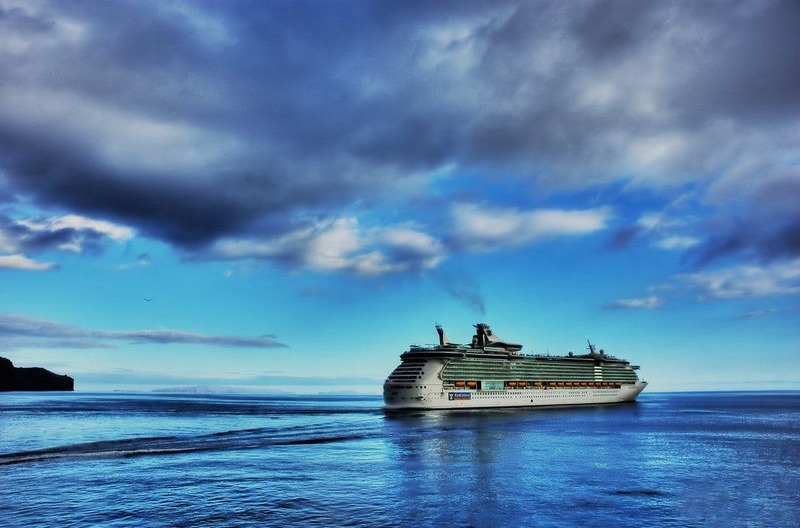 Of course there won’t be exclusively low-carbohydrate foods served – we’ll “only” be around 300 people out of the 4,000 passengers that the ship can take. There will be fabulous food and less good food … it’s your choice. The great benefit from these trips is the chance to get to know a lot of other exciting people with partly shared interests. It’s educational, for sure. But foremost it’s an adventure. The cost of the cruise including cabin, food and non-alcoholic beverages is from $900 and up. Airline ticket, pocket money and other expenses will be in addition. Do you want to come on the cruise and have an exciting story on health improvements and/or weight loss on LCHF that you want to share? There will be plenty of opportunities for a video interview. Email me in advance at andreas@dietdoctor.com. Here are a couple of the interviews that we’ve recorded on previous cruises. This year we’ll set a higher goal and record a lot more… and of course in higher and higher quality. We have no financial interests in the cruise and I don’t get paid for my lecture. Looks awesome. But how much does it cost. The website doesn't say. I am interested in this cruise because of the itinerary of lecturers scheduled; however, if I can get the cruise cheaper through my own travel agent, may I still attend the lectures? Thanks Sherrie. I did that. So I actually have to register to find out how much it costs? Seems strange. I would just like to know before I go to all the trouble. VERY IMPORTANT: IN ORDER TO PARTICIPATE IN THE LOW CARB GROUP SEMINARS, YOU MUST BOOK THROUGH THE LOW CARB GROUP. We apologize if you have a favorite travel agent that you regularly use, but the cruise line will only allow us to reserve a meeting space for the total number we show BOOKED with our group. Also, your favorite agent will not be allowed to add you to the Low Carb group. International Tours of Houston, agents Debbie Hubbs and Becky Gandy, are the only ones allowed to do that (contact information below). Thanks for your understanding. Susan, I found this under the FAQ's: The FAQ's are found if you click on the link "Read More and Register" under the Summary paragraph. SPECIFIC prices for the group are listed under the “reservations” tab, but the BEST WAY to get a specific quote is to contact DEBBIE HUBBS (ddhubbs@msn.com) or by phone (480) 326-8210. There is a $75 per person seminar fee that will be added to the total registration. The exact cost depends upon the cabin category you choose. The rates are locked in for the group until our allotment is filled. After our group allotment is filled, more reservations can be made in the group but at the current cruise line rates. Sometimes, as demand increases, these rates can be subject to change. The cruise line can adjust the rates depending on how they need to fill the ship. For example if all of the inside cabins are getting close to being sold out, they may drop the rates of the window cabins to get people to book those instead. We have no control over that. The price of each category is based upon its deck level. The higher decks cost more; lower decks cost less. If rates should drop for your cabin type, Royal Caribbean Cruise Lines will let us submit an upgrade request, but only if there are cabins available in our reserved allotment. It is subject to Royal Caribbean Cruise Lines’s discretion. Registration payments must be made by debit or credit card. If for any reason a refund is required, Royal Caribbean Cruise Lines will refund to the original card on file. IF you have changed credit cards, you may have to wait 6-8 weeks for a refund check to be mailed to you. Susan, I'd just give them a call and that travel agent should be able to work out a price for you before you go to the trouble of registering... I would think. I was on that same cruise last week as part of JoCo Cruise Crazy 2015! I recommend the scenic train tour of St. Kitts. Between bus and train, you circle the entire island. If you like sci-fi, check out the "Yoda Guy" museum in Phillipsburg. It is within walking distance of the port in the downtown area. This trip looks amazing. Do you know the dates for 2016 as my husband and I would love to go on it and attend all of the lectures too. We are in Australia so need an early 'heads up' to get bookings done!